Water Damage can be costly for homeowners and sure to happen at some point. Orange Restoration San Diego breaks down the costs necessary to avoid further damage. So, you have got water damage in your home. A fact that surprises many people is that almost every single family and home will suffer water damage at some point – it is much more common than fire in the home and burglary of the home combined! However, just because it is common does not mean that it is an enjoyable experience, far from it. Water damage can occur slowly, so that you do not realise that it is happening for months, or very suddenly so that you wake up and your entire world has changed. When water damage has been occurring for a long time, that often means that it is being sourced from a slow leak, or an area of the home that is not properly insulated and occasionally lets water in. Slow water damage has several characteristics that sudden water damage does not share. Firstly, it encourages mold to grow because the water damage is not spotted for a very long time. As the mold spreads, it takes the water damage with it, and mold that is left untreated for a long period of time can start to cause breathing problems for those that live in the home. Secondly, it can cause your home to slowly rot, and the longer that it goes on the more irreparable the damage – and the more of the walls, or ceiling, you will have to replace. Very sudden water damage, on the other hand, can be more obviously destructive much quicker. This sometimes happens when a water pipe in your home completely bursts or shatters, so instead of a gentle drip, you get a large torrent! There are other occasions when you could have sudden water damage, but they are often circumstances that you cannot plan for, such as a tree falling onto your roof and letting water in, or a river bank nearby bursting and flooding your home. There is little that you can do to prevent these, but that does not mean that you do not have to deal with the consequences. One of the most upsetting aspects of water damage is that it can completely destroy so much of your home. You would not think that water could be such a damaging force, but when you think about it, water will totally end the life of any electricals that get soaked in water. It is very rare to be able to resurrect them, and that means that you could have a huge cost to replace them. Even more upsetting than that, water damage can ruin beloved clothes and papers forever, including bank statements, love letters, and children’s paintings. Water does not discern between different items, and so you could find that the cost of water damage repair goes further than just monetary value. It would certainly be a frightening proposition, dealing with all of this yourself; the removal of the water, the drying of your home, the reparation to the parts of your home that have been damaged, and the massive overall cost that all of this creates. 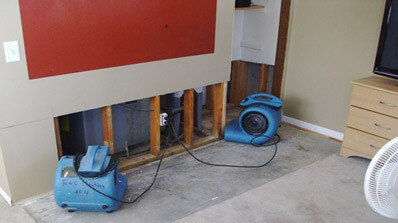 On the other hand, you may find that your insurance company will automatically cover the cost of water damage repair. Many insurance companies will do this now, and that means that you will not have any of this hassle to go through – they will deal with it all for you. If you are experiencing any water damage it is crucial you contact an experienced restoration company ASAP! At Orange Restoration, all of our technicians are fully certified and trained in all facets of damage restoration. We will respond quickly and get your property back to its original state in no time at all. We are available for 24/7 emergency services. Give us a call today!